With the recent advancements in technology, many houses are now slowly transforming into next generation homes. Take yourself back thirty years; a home was literally a four-walled house with a chimney, wood fire and typical wooden framed windows. Today we are seeing more and more houses take to solar paneled energy, automatic sliding windows and touch sensitive doors! This being said, there are a few home designs out there that have truly took houses into the future. Below we have put together a list of 5 of the most futuristic homes the world has to offer. There isn’t anything much more futuristic than a spaceship, and the Moebius House in Australia resembles just that. Located in Sydney, Australia, this creatively designed home looks like a true space relic, yet can be found in the center of a typical housing estate. The house is made up of a white concrete paneled material and boasts an attractive and sleek design structure. The main futuristic attribute to this home is its ability to respond to ever changing weather conditions. That’s right, the house has being naturally designed to create the right temperature inside, whatever the weather outside. The design of the house, which includes Ferarri windows, has being cleverly designed making the use of geometrically thought out curves and slopes, that make for natural cooling and shading, limiting the need for heating and cooling devices. Located on a hillside in Strugget, Germany, the OLS house boasts a sleek and contemporary, space inspired design with generous views overlooking a beautiful landscape of hills and valleys. This 5252 sq ft family home was developed with an old conventional structure, being that the central element consists of a winding staircase connecting all three levels of the home. The staircase allows for an illuminating beam of light to radiate throughout the home, bouncing off of the fresh and shiny white furnishings and walls. The roof is finished off with solar panels, and the balcony floor is made up of pre-weathered zinc plates. The natural design lets in the light, and the white and grey polished concrete structure adds to the space like impression. The houses curved structure also gives it added benefits, such as natural shading and streamlined wind protection. This stunning and futuristically designed home was built on the concept of birds’ wings, hence the name. The house was designed by Portuguese architect Bernardo Rodrigues and is located on S. Michael Island in the Azores. The architecture is predominantly composed of curving volumes, mixed with a range of sheltering panels and contemporary shaped windows, allowing a natural flow of light into the home. As well as letting in light, much like the OLS home, the design of the building was built in order to combat the natural flow of strong winds that this area frequently experiences. There are also diverse patios and courtyards on the ground floor, built in order to protect the home from the rain. As well as this, the walls where built using glass windows, allowing the residents to enjoy a 360 degree view of the spectacular green surroundings. H3 House is a beautifully designed home situated in the heart of Athens. Much like many Greek buildings, the core of the property is held by pillars, which help to support the roof and ceiling structures. The house naturally gives off an impression of flotation, given that it is built hovering over a large swimming pool. The architects were yacht lovers, which may be represented through the use of the large swimming pool. This house uses an extremely clever geothermal energy source, which aids in the house being largely eco-friendly. The contemporary white polished concrete and unusual design give off a very modern impression for this home, and almost makes it look like a luxury spacecraft flying over a clear water lake. We take a trip back to Germany for our last futuristic home. 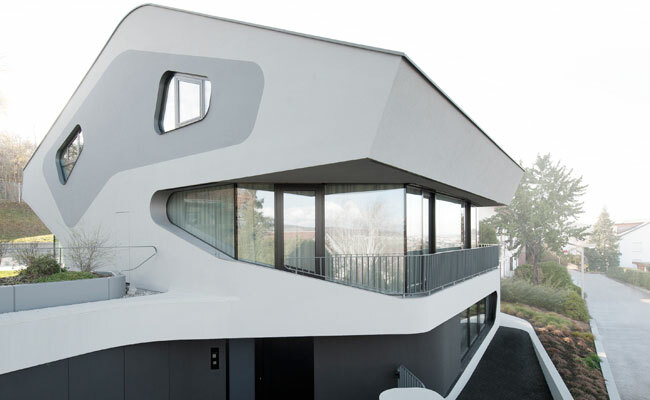 Situated in Ludwigsburg, the Dupli Casa was built in 2008, and was actually a renovation of a home built in 1984. This three story building’s white shint colour naturally lets in the glow of the greenery surrounding it, as well as allowing natural light to bounce off inside the home. Windows on each floor are angled specifically to allow a perfect view of the beautiful surrounding landscape. The lucky homeowner has the pleasure of relaxing in both an indoor and outdoor swimming pool, again overlooking some beautiful landscape and shrubbery. The middle of the house is made up of a large atrium with huge windows really making this home a true spectacle.